This 30-Minute Baked Tofu recipe is my favorite way to make tofu! It’s ultra-easy, totally customizable with your favorite seasonings, and surprisingly crispy and delicious. 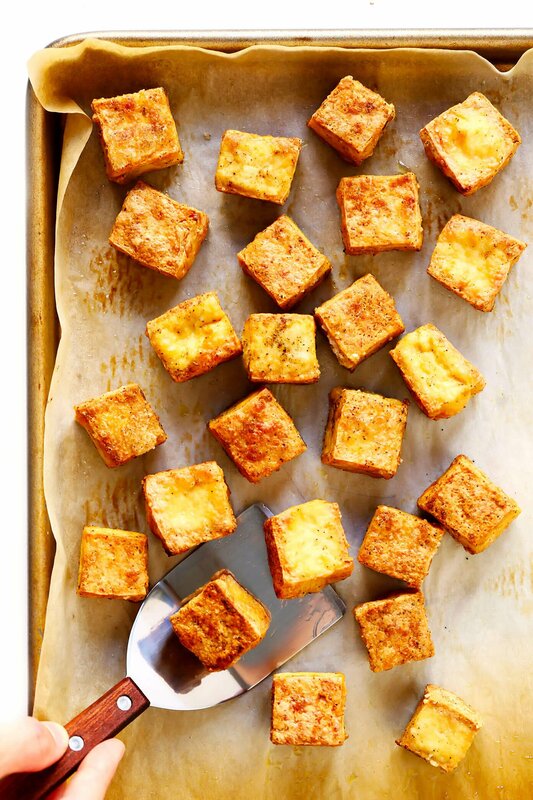 …how to make baked tofu! I admittedly never used to be the biggest fan of tofu. But after meeting and marrying a vegetarian who absolutely loves it, tofu has found its way into our weekly dinner rotation nowadays about once a week. And I’ve come to appreciate how awesome it can be when prepared well, plus the multitude of ways that you can prepare it! We love it nice and soft in soups (hello, miso soup, hot and sour soup and sundubu jjigae). We love chopping and mixing it into sofritas and healthy meatballs (coming soon) and veggie burgers. We love popping it on the grill and searing it up in a skillet. But most of the time? We love making this ultra-simple baked tofu recipe in the oven. It’s just about the easiest recipe in the world, and yields a batch of tofu that is surprisingly crispy on the outside, yet still nice and soft on the inside. And perfect for topping steaming bowls of soup or curry noodles, tossing with sauce in a tofu stir-fry, adding to burritos or salads or tacos, or whatever else may sound delicious. And of course, this basic recipe is also easily customizable with your favorite seasonings or sauces that you’d like to add. So whether you’ve been on Team Tofu for years, or you’re a newbie ready to give it a try, here are all of my best tips and tricks for how to make the best crispy baked tofu recipe you’ve ever tried!